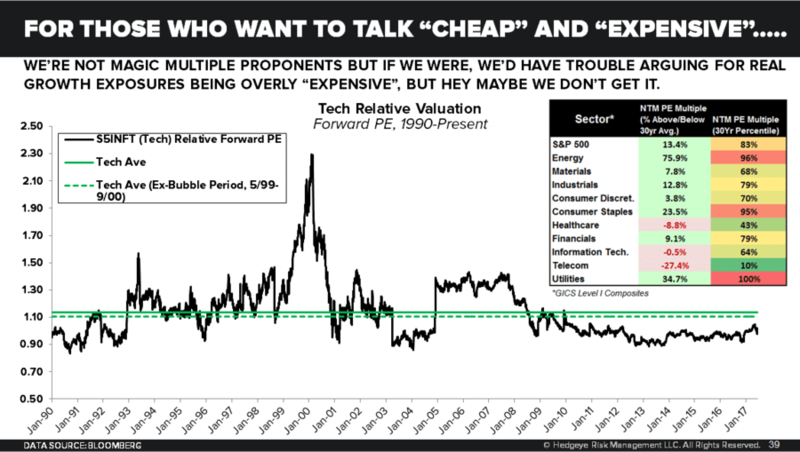 2 Charts on "Expensive" Tech Stocks: Freak Out or Buy the Dip? 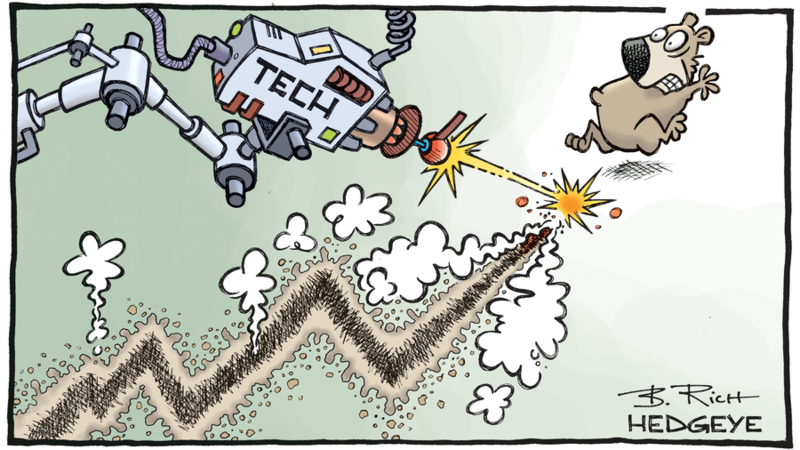 Tech stocks were down as much as -1.3% today. News outlets are blaming the selloff for escalating tensions with North Korea, Fed head speeches and technical analysts who say the Nasdaq's 50-day moving average is "under seige." Perennial stock market bears would add another reason for the selloff in Tech: Expensive valuations. It's something bearish investors have been warning about for some time now (for much of 2017 despite Tech being up 18% year-to-date!). But Tech stocks aren't "expensive." But Utilities, Energy and Consumer Staples stocks sure. Consider history. 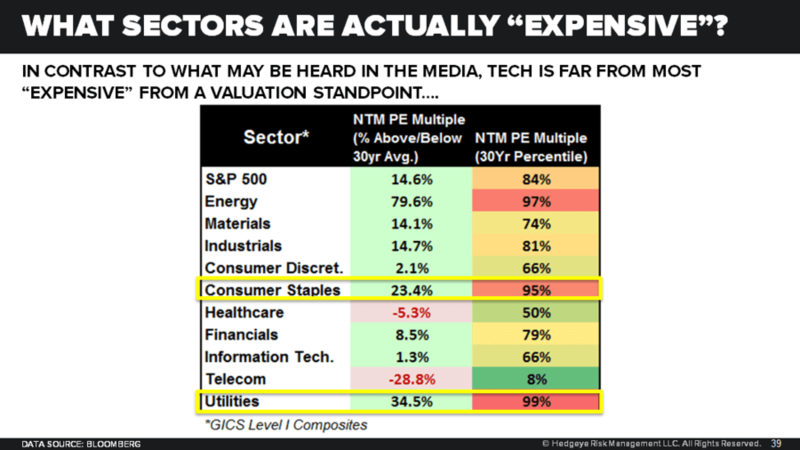 If you look at each sector's next twelve month P/E on a 30-year percentile basis it shows Tech stocks are not expensive. On this metric, Tech's reading of 66% is relatively cheap. Put another way, 44% of Tech's P/E ratios over the last 30 years have been more expensive. Compared to 99% for Utilities this is nothing. But What About the Tech Bubble?! Selloffs happen. We don’t rely on the “feel” of supposed market gurus, or “valuation” or the maxim that “this time is different.” Rather, our process rests on the foundation of analyzing the dynamic history of markets. In addition to this fundamental research, we have a proprietary risk range model (Daily Trading Ranges) that incorporates elements of behavioral psychology to help investors make better buying and selling decisions across different asset classes. So is it time to buy the Nasdaq? Click here to learn more about Daily Trading Ranges. Merkel Secures Chancellor but Political Challenges Ahead?